Leahy Vows to Unveil Events that Led to Firings Sen. Patrick Leahy (D-VT) says he was outraged when he learned of previously undisclosed White House involvement in the removal of eight U.S. attorneys. The Senate Judiciary Committee chairman had been assured by Attorney General Alberto Gonzales that his panel was fully briefed on the matter. Sen. Patrick Leahy (D-VT) says he was outraged when he learned of previously undisclosed White House involvement in the removal of eight U.S. attorneys. The chairman of the Senate Judiciary Committee had been assured by Attorney General Alberto Gonzales that his panel was fully briefed on the matter. Wednesday, the Senate plans to continue its hearings on the dismissal of eight U.S. attorneys — and the possibility that their removal was politically motivated. Late Monday, reports surfaced that the idea of the dismissals originated at the White House in 2005. MICHELE NORRIS: And Senator Leahy joins us now from Capitol Hill. Welcome to the program, Senator. SENATOR PATRICK LEAHY: Thank you. Good to be with you. MS. NORRIS: What was your initial reaction to reports that the firing of this group of attorneys actually initiated at the White House? SEN. LEAHY: I was outraged. I remember walking out on the dock to pick up the paper about a quarter to 5 this morning; I walk into the kitchen; I looked at that, and I just — I just blew my stack. It was outrageous, because we had given the administration, the Department of Justice, every chance to come forward and tell us everything that happened. They assured us that they had told us everything that happened, and yet they left out some very, very key points. I saw the attorney general this morning in a meeting at the Supreme Court, and I told him that I was very, very unhappy with this — actually quite angry about it. MS. NORRIS: And what did he say? Were you at all pleased with his reaction to that statement? SEN. LEAHY: He said that he would be happy to come up and brief us some more. I said, "No, I've had enough of these briefings where ostensibly we're told everything; it turns out we weren't. The next time you come up will be before the full committee; it will be an open session; and you will be under oath." MS. NORRIS: Now, you say that you're outraged by this, and even though your colleague, Charles Schumer, has called for the resignation of the attorney general, you yourself have deliberately not called for him to step down. Why not? Or has that perhaps changed today? SEN. LEAHY: Well, no, I was very careful in what I said. I said that the attorney general serves at the pleasure of the president. The president has to determine whether this is the kind of operation that he wants, that he is comfortable with, this withholding of information, this politicizing of prosecutors. If that's the standard that President Bush thinks he should have for his administration, then that's his decision. Right now, what I want to do is find out everything that happened. I want to do it with this attorney general. I want to do it with the people who are with him. I find even the person that supposedly resigned, Mr. Sampson, is still there at the Department of Justice. So I want to find out from these people; we'll subpoena whomever we need; and we will find out. MS. NORRIS: Now, when you say he is still — Mr. Sampson is still there at the Department of Justice, clarify that for me. SEN. LEAHY: He left supposedly, according to what the Department of Justice said, as Attorney General Gonzales' chief of staff. We found out this afternoon after the attorney general's press conference that Mr. Sampson is still there while he, quote, "goes job hunting." Come on; if you did something wrong and you're out, you should be out. MS. NORRIS: Now, you might quarrel with the timing of these firings, and even in the way that these firings were carried out. But it seems that you could argue that this is the administration's prerogative, that they can run the department as they see fit. SEN. LEAHY: What I quarrel with is the fact that they did not tell us the truth about what happened. What I quarrel with is the fact that even though they were under oath, they withheld information. That is unacceptable. I realize that they were used to having six years of a complacent rubber-stamp Congress controlled by their party. That changed in last year's election. We're going to ask questions. I would ask these same questions if it was a Democratic administration. I'm not going to accept half-answers and I'm not going to accept misleading answers. I want full answers; I want them under oath. MS. NORRIS: So, if you want answers, who do you plan to summon to get to the bottom of this? Does this mean that you intend to issue a subpoena to Karl Rove or perhaps others at the White House? SEN. LEAHY: I will subpoena whomever necessary to get all of the facts. Obviously, the attorney general will have to come back; Mr. Sampson will have to come back; I think Harriet Miers, directly involved, will have to come back. There could be a number of other people. What I want to do is the same thing I used to do when I was a prosecutor: build a case; go to whoever I feel, and the committee feels, is essential to uncover the truth; we will have them come and testify. MS. NORRIS: Does that include Karl Rove? SEN. LEAHY: If Karl Rove is necessary in there, of course. MS. NORRIS: As you do plan to call people forward before a full committee, some might say that this continued investigation might seem a bit excessive. They might argue that there are more important issues for lawmakers to be looking into right now. SEN. LEAHY: This is not the only thing that's going on in the Congress. We have everything from the budget to the war in Iraq going on. But I think it's extremely important if somebody is trying to manipulate how prosecution is done in this country. It's hard to think of many things that are more important than that. After all, that affects your liberties, my liberties, and it affects the safety of all Americans. 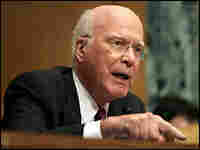 MS. NORRIS: Well, Senator Leahy, thank you so much for speaking with us. SEN. LEAHY: It's good to be with you. Thank you. MS. NORRIS: That was Senator Patrick Leahy. He is chairman of the Judiciary Committee.